Marsh is the son of one of the females we placed named MRL Courageous. He is also the littermate to Salt Life that we placed earlier this year. We expect him to be a wonderful guy like his mom and brother. His sire is Get Over. Marsh turned 2 on May 17th. Marsh was a good racer and raced most of his 96 races at Tri State in WV. Then he moved down to Orange Park in Jacksonville FL, where he retired from in November. He traveled nicely on his trip up from the track. He seems like a calm well behaved guy so far. He needs some encouragement to go in a crate but once there he is totally quiet and doesn't make a peep unless he needs to go outside. Then he will stand up and whine quietly. He was raised on a farm around smaller dogs and small children so he should be fine with both. More as we get to know him. Perogie was quite the racer, winning top level A races and racing and winning quite a few stakes races too. She raced 62 races at Derby Lane, Dubuque, and finally at Palm Beach. 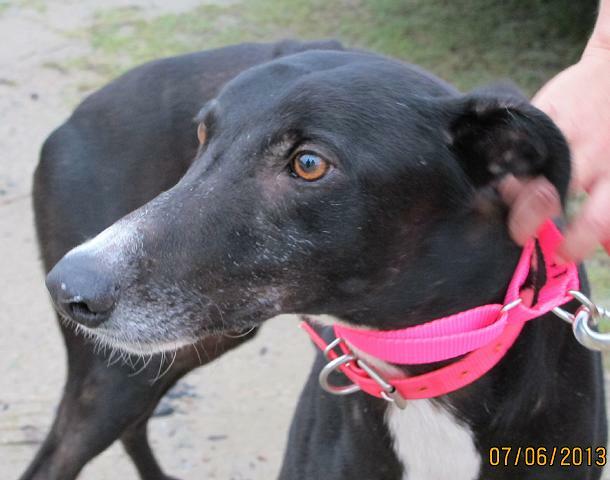 Because she was such an amazing racer she had 4 litters of pups before she officially retired. She was the mother of one of our adopter's pups and she tracked her down and asked if she could foster her. She is a sweet, calm girl whose favorite thing is napping. After raising 20 pups she knows the value of a nap. 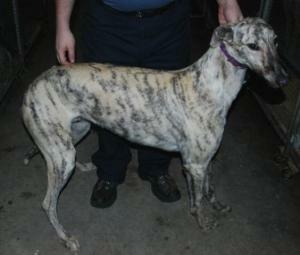 Perogie was born on March 7th of 2005 and raced at 63lbs. She is being fostered with small dogs and is fine with them. 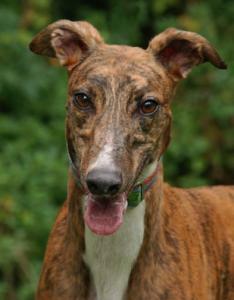 Elaine is a beautiful brindle girl that just arrived. Her mom stepped on one of her back legs when she was a small pup. Even though it isn't noticable now and doesn't bother her at all or cause any limping, her owners decided not to risk racing her. They gave her to us to pet out instead. She runs and plays and doesn't have any limitations as a pet. She is a sweet, friendy girl that just turned 2 on December 8th. She travels well and likes to go for rides. She is quickly learning leash manners. Her trainer at the track says she is very waggy and happy girl. Her sire is the very famous Kiowa Sweet Trey and her dam is Deco Caraways. So far she has done very well in her foster home with cats and small dogs. As soon as she arrived she climbed up on the couch and made herself comfortable. She likes to snuggle with other dogs and people. She is a very calm girl for one so young and very well behaved. She is being fostered in a townhouse and is normally quiet in her crate. Otto is a handsome red brindle male who is a big 83lbs. He is a littermate to KJ's Oscar who we also placed. He will celebrate his 3rd birthday on Oct 7. He raced 34 races starting out at Bluffs Run in IA, then going to Sarasota Race Track in Florida and from there Sanford Orlando. His sire is KJ's Yukon Gold and his dam is Gilded Rose. He is a smart boy and his trainers say that he learned how to open the gates in the turn out pen and let himself and the other boys back into the kennel. He passed his cat test at the track so he should be able to live with cats and small dogs. He is calm and friendly according to his trainers. 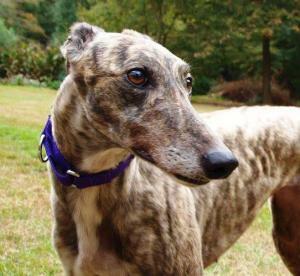 Gina is a beautiful white girl with brindle patches. Her sire is the very famous Kiowa Sweet Trey and her Dam is Deco Hexagram. She just celebrated her 4th birthday on August 8th. She raced at 66lbs. 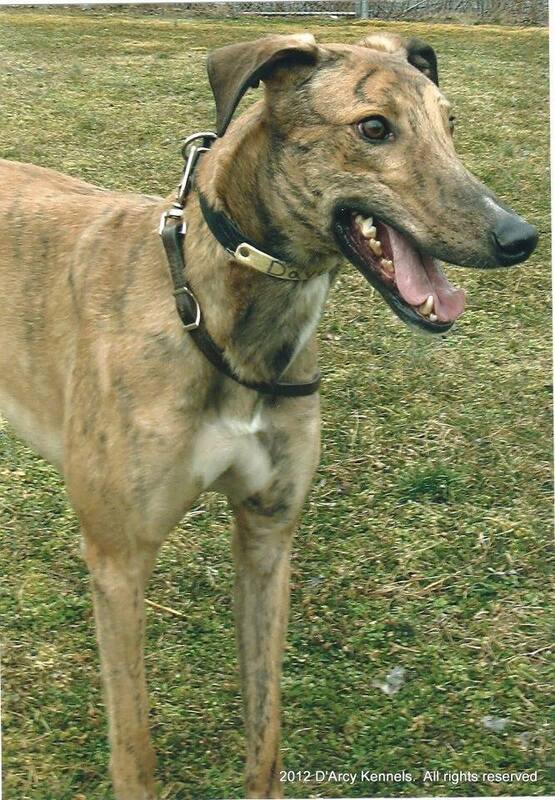 Gina was an excellent racer that raced 101 races at one of the top tracks, Wheeling Downs in WV. She is a friendly sweet girl that travels well. She passed her cat and small dog test with no interest in chasing either so should be fine to live in a home with cats or small dogs. She is being fostered with a toddler and has been very good with her too. 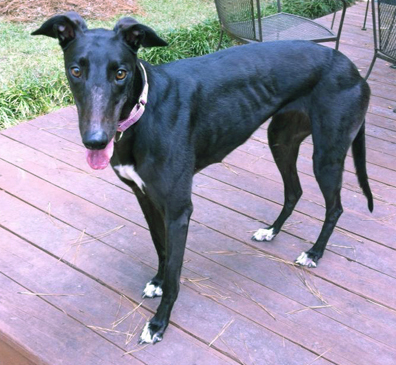 She is a well behaved girl that has settled into foster care very well and is very sweet and loving. Tecate is an extra large boy that raced at 84lbs. His sire is the famous Flying Penske and his dam is Kay Shivon Sissy. He will celebrate his 4th birthday on Feb 22nd. Tecate is quite the traveler, racing at Caliente in Mexico, then Palm Beach, Flagler and Naples Ft Myers in Florida with a total of 94 races. We don't know if he is bi-lingual but we do know that he knows his name very well. We pronounce it Ta Cot EE like the beer. He is a friendly happy guy that seems pretty calm and well behaved. He potties very well on leash so may do well without a fenced yard if his family was willing to leash walk him. He was a little interested in the cats at the vet clinic but not overly so, so we think he may be cat trainable. We need to do more testing with him with cats. He has met some small dogs and does fine with them after an initial sniff to find out what they are. He crates well and has been quiet so far in his foster home and is living in a townhome so should be fine to live in an apartment or a townhouse. This is an extra sweet boy that was a kennel pet at the race track. 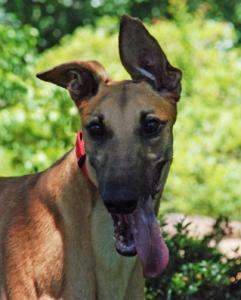 Hunter is a 75lb deep red male that has had a successful racing career and was a finalist in a stakes race!! His birthday is Nov 5th and his sire is the famous Flying Hydrogen. He has lived in a home before so is already home acclimated and has good house manners! Hunter is very calm and laid back but still enjoys playing. Don't let Hunter's sad eyes in his photo fool you, he is a very happy, loving, outgoing boy that craves attention. His foster home says "lives for love". If you want a dog that wants to stay close and is always happy to see you, Hunter could be your boy. He was returned after about a year because his owner developed life threatening health problems that prevented him from caring for a pet. Although Hunter lived in a townhouse with his previous owner, he can be a little vocal sometimes in his crate. We don't think he will be a good choice for a townhouse or apartment unless his new owner is home with him all the time like his previous owner was. Hunter needs rules and boundaries set and will quickly obey because he wants to please. He thrives in that type of situation and just wants and needs to know what you want him to do. Hunter loves kids but does tend to over react when it comes to play or a perceived threat, so we think he would do better actually living in a home with no kids. Hunter likes other dogs and but can get too rough very quickly so needs to be placed as an only dog. He was an only dog in his first home and was fine with that. Hunter passed his initial cat test but he did try to chase a cat in one of his foster homes so has had mixed results. Hunter can be protective of his home and space with strangers so would need a quiet home that doesn't have a lot of guests. Cam just arrived from the Orange Park track in Jacksonville. He is a littermate to a dog we already placed Easi Cherry and her owners have been waiting for him to retire. He broke his leg in his last race and his owner and trainers had surgery on the leg to repair it so we had to wait even longer for it to heal up before we could get him. He is with us now and is just as sweet as we had hoped. His sire is Be My Bubba and his dam is Momoni Chris. He was born on Oct 25th and raced 139 races. His foster family is planning to adopt him. 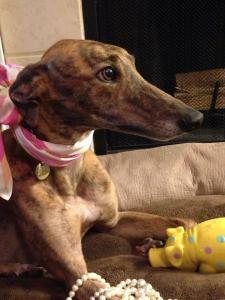 Queenie is a tiny brindle female that raced at only 54lbs. Unfortunately she is having to start over looking for another family at 12 years old. She turned 12 on September 29th. 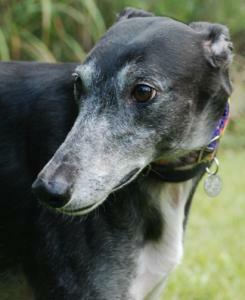 Queenie was adopted through our group 9 years ago and has been in an adoptive home since then. She was returned to us because of changes in her family that led her owner to make this difficult decision, not because of any issues with her. Queenie has been fully vetted and had to have quite a few teeth pulled. Other than that, our vet has declared her healthy and doing very well with a pep in her step that says she doesnt know her age. She lived with children and other dogs in her previous home so should be fine with both. She is already home acclimated and has good manners. Being an older girl she loves to sleep on a comfy bed and you can find her doing that most of the day but she also likes to do some sun bathing outside. Kitty Kat is a pretty blue girl that is a littermate to one of our volunteer's dogs. She has been waiting on her to retire and will have her join her family if the two girls like each other when they are reunitied. Kitty Kat is arriving soon from the Mobile race track. She race 164 races in Mobile, AL and Palm Beach FL and got up to A level so was pretty good. She raced at 63lbs. Her sire is Trent Lee and her dam is Solitary Elusion. She celebrated her 4th birthday on May 16th. Kitty Kat potties nicely on leash and was quiet in her crate so may do OK in an apartment. She is very friendly. Kitty Cat was adopted and renamed Catalina. She crossed the bridge in Augusta of 2017 after running into something playing in her yard. She will be missed by her mom Denise and everyone that met her. 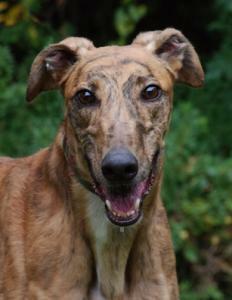 Dave is a sweet friendly brindle boy that is a littermate to Echo of Light (Ed) that arrived on the same load. He is a very large male that raced at 83lbs. His sire is the very famous Kiowa Sweet Trey and his dam is the famous Dreamy Blossom. He was a good racer that raced at one of the top tracks Wheeling Downs in WV. Like his brother he raced at the top levels A and AA. He has 68 races listed. Dave passed his cat and small dog test so should be able to live with either. He also likes the children he has met. 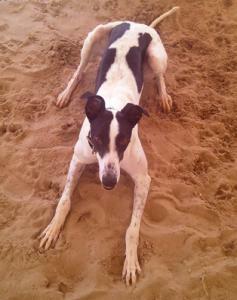 Cara is a gorgeous white girl with black spots that is arriving from the Derby Lane Track in St Pete Florida. She raced 55 races there and at Wheeling Downs in Wheeling WV. She raced at 64lbs and will celebrate her 3rd birthday on January 1st. Her sire is Rhythmless and her dam is Forever Together. 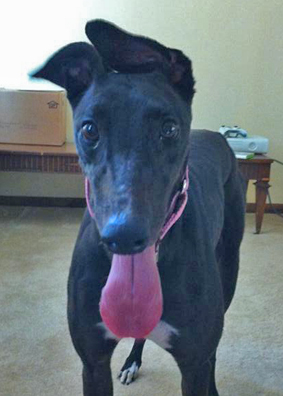 Her trainer says she is a happy bouncy girl that is pretty energetic and fun for a greyhound. Very friendly, loving and sweet. Cara traveled well on the trip up from the track and was perfectly quiet in her crate all night the first night. Her foster home raved about what a doll baby she was and how sweet she is. When she arrived at the vet she was pretty excited about the cats so probably is not going to be cat friendly but we need to do further testing to be sure. Be sure to check her other pictures to see a picture of her as a puppy. Spicer came from the Mobile Al race track where he raced 107 races. He raced at Southland in Arkansas, then at Palm Beach and Orange Park in Florida and finally moved to Mobile. He is 4 years old and celebrated his 4th birthday on June 1st. He raced at 71lbs so is a mid sized guy. His sire is Deerfield Site and his dam is Bob's Streak. Spicer is doing fantastic in his foster home. He is good with small dogs he has met. He loves to play with toys and squeaky toys are his favorite. He is a happy loving guy. 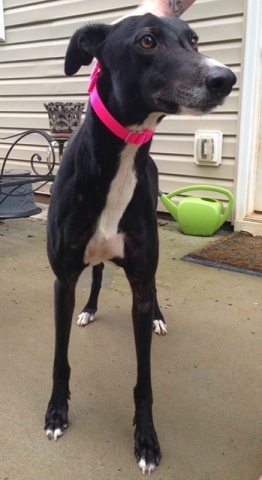 Angela is arriving soon from Derby Lane. Even though she went to the track she just never did well in her practice races so will retire without one official race. She is a young girl that won't even turn two until March 7th. She is a tiny girl that is only 55lbs. 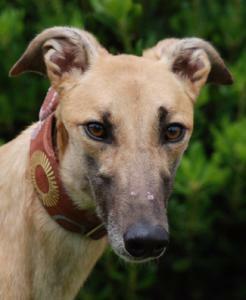 She has a fantastic personality and is very friendly and waggy and will even smile when happy or excited. Really cute little girl! Her sire is from Ireland- Kinloch Brae and her dam is Susanna Salter. More as we get to know her. 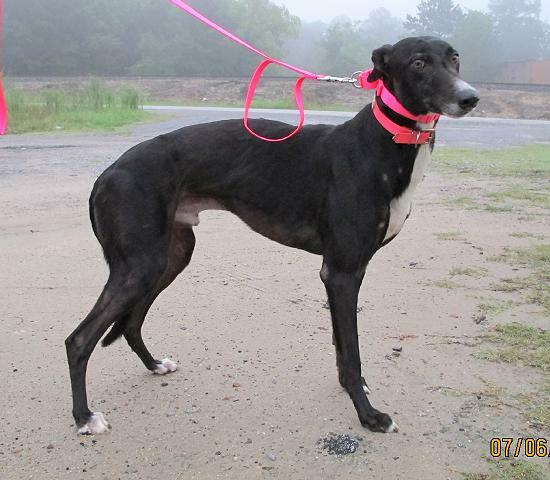 Willy is a young boy that only has one race listed at Tri-state in West Virginia. He raced at 65lbs so is a small male. He is a young guy that turned 2 in June. His sire is the famous Trent Lee and his dam is Kiowa Patty Jo. 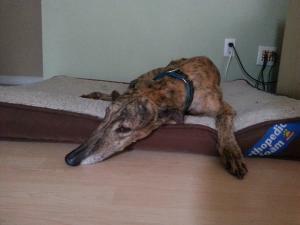 Â Willy has already been home acclimiated and has been living in a home since March. He is a sweet handsome boy that was returned to us because he cut his feet while running around and his owner didn't want vet bills. It was only a minor pad injury and his feet are fine now. 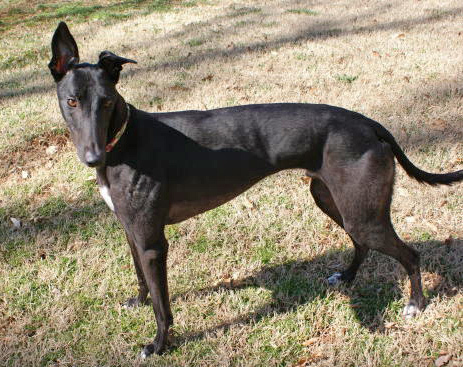 He is a higher energy greyhound that likes to run around and needs a safe yard without sharp things in it so he can do that safely. He passed his cat and small dog tests so is OK to live with either. This is a sweet loving boy that loves to play with toys and is doing great in his foster home. 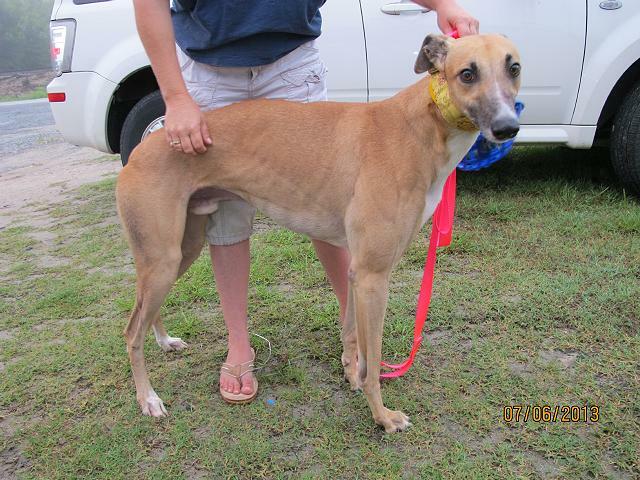 Atlas just arrived from Derby Lane in Florida but he also raced at Southland in Arkansas. He raced at total of 41 races. 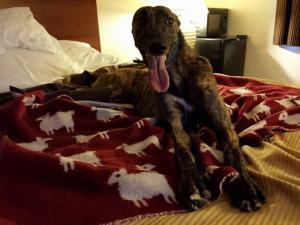 He is a handsome, dark brindle boy mostly black with some light fawn stripes. He just turned 3 on October 26th. He traveled well on his trip up from Florida and has been quiet in his crate since he arrived. He is very friendly and loves people. He is a pretty big guy racing at 80lbs. He does pull on the leash some because he is excited to check out everything new. He does correct pretty well though. His sire is Irish- Vina Marina and his dam is Atarah. More as we get to know him. 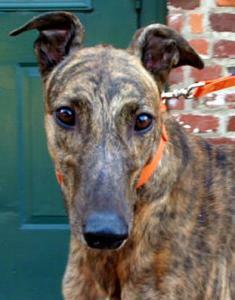 Mandy is a brindle female that just arrived from the Mobile race track where she raced 41 races. She celebrated her 2nd birthday on January 2nd. She raced at 61lbs. Her sire is Astartwelvegauge and her dam is Chel's Rocknroll. She travelled well on the haul and is a cute bouncy girl that gives kisses to everyone she meets. Very loving and happy. She curled up in a tiny ball in the crate and just laid their smiling. She pottied nicely on leash so may do OK without a fenced yard. The staff at our vets office commented on what a bubbly happy personality she had. They really liked her. She did pass her cat test so should be fine living with cats and small dogs. Preacher Man is a littermate to another boy we placed so we were on a waiting list to get him when he retired. He is a beautiful rare blue brindle that raced at 76lbs. He just turned two on November 7th. His Sire is Kiowa Wish Frank and his dam is Pasampsi. 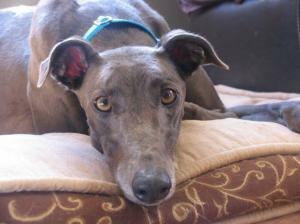 He is a calm, well behaved boy that is sweet and friendly. He has been fostered in an apartment and is quiet and potties on leash nicely so would be perfect for an apartment or townhouse living and doesn't require a home with a fenced yard. He is good with kids, cats and small dogs. Just a wonderful, friendly loving gentleman. Submissive won't even be 2 until March 23rd. He broke his leg while training to race in Dubuque so we were asked to find a home for him before his race career got started. His leg is splinted and has been healing up for over a month already. We had our vet check it when he came in to see how it looks. We expect him to need a couple more weeks or so more of leash walking but expect him to make a good recovery. Submissive's sire is the famous Flying Hydrogen that is owned by one of our board members. His dam is Slatex Sassy. He is a very smart guy that has learned to take off his own muzzle. He travels well and is a very sweet friendly boy. He had already learned to get up on the bed before we ever got him. The photo of him was taken before we got him. Submissive passed his cat and small dog tests so should be fine to live with either. He has liked the children he has met too. He is a great guy! 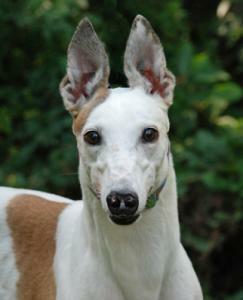 Kane is a gorgeous light fawn boy with dark ears and dark hair tips, almost sabling. he will celebrate his 5th birthday on Nov 8th. He raced at 66lbs so is a smaller male. 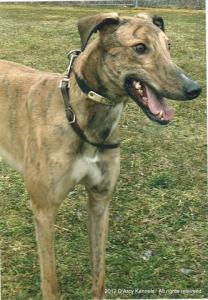 Kane had a long successful race career of 200 races at Orange Park in Jacksonville Fl. He broke his leg in his last race and his racing owner paid to have our vet do a surgical repair and for his boarding there while it healed up for the last couple of months. Unfortunately he developed a dangerous bone infection after surgery and he ended up losing his back right leg. He gets around fine without the leg though and as long as he stays thin he should be able to do stairs, jump on and off furniture, and run and play like any other dog. Our vet says Kane has been a wonderful guest there and has become a favorite of her staff. He just hangs out in the treatment room with her own tiny dogs and the cats that live there and is very good with all small animals and all people he has met. He has been very good with all the treatment he has recieved and just loves people and attention. He is very very calm and well behaved. 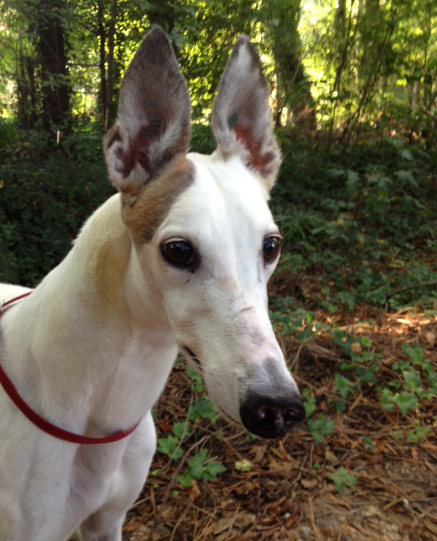 Our vet said she wished she could keep him herself because he is one of the sweetest greyhound she has ever treated. This tripod is a very special boy in more ways than one. Kid is being returned to us from his family where he has lived for 6 years. He just turned 9 years old and has been living with a more dominant male littermate all of his life. He was always the submissive one of the two brothers. Recently he decided he no longer wanted to be pushed around and the two boys have not gotten along since. 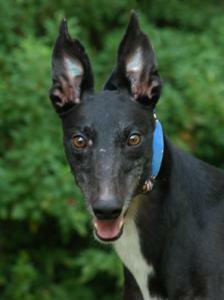 Kid has been a meet and greet dog and is very friendly and sweet with people, cats, small dogs and other greyhounds. He is currently living with cats and children. 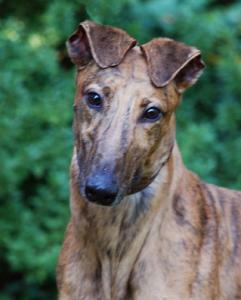 He is an extra large male that is very tall and is an unusual light fawn brindle. He raced at 85lbs. His sire is Hey Zohar and his dam is Lofty Girl. He was born on Oct 16th of 2004.These photos are all from Kid's racing days and we are hoping to get more recent photos of him up soon. Rack just arrived from the Ft Myers track adoption kennel. He is a 76lb male that was a very good racer. 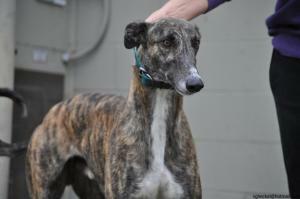 He was actually one of the best racing greyhounds in the country placing #20 in US racing in 2011. He was a finalist in the 2011 Bluffs Run Juvenile Stakes Race. He has 126 races listed and raced at Bluffs Run in IA and Naples Ft Myers race track in Florida. His sire is the famous Kiowa Sweet Trey and his dam is Samera. He celebrated his 4th birthday on April 19th. He is very outgoing and friendly and very sweet. Skinny Minnie came to us straight from a farm. She isn't going to race because she was sick as a puppy and was the runt of her litter. After running a lot of tests they found that she had Pancreatic Insufficiency which meant that she didn't produce the digestive enzymes that helped her digest her food. She will need just digestive enzymes and is fine as long as that is done. She is about 40lbs now and is going to stay very tiny. We don't think she will even get to 50lbs which is the size of the smallest female greyhounds. Minnie's dam is Dream Doll and her sire is Kiowa Mon Manny. She is the third greyhound pup of his we have had with this condition.The first is already adopted out and is living a healthy normal life and has had no further trouble since we started her on digestive enzymes. 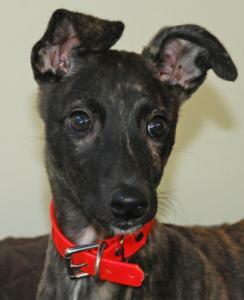 We don't normally get pups from the farms so this is a rare opportunity to get a greyhound puppy. Minnie was in a foster home with cats and did well with them. She is playful and fun but seems pretty calm for an 8 month old pup. She was very good with the kids and adults she met at a recent PetSmart meet and greet. Because she is still a puppy she will need a home with a fenced yard to run around in and won't be suitable for apartment living. 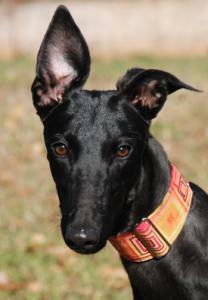 Pearl is a small, beautiful, black female that raced at 57lbs. She just retired from the Sanford Orlando Race Track after 58 races. She also raced at Gulf in Texas briefly. She is sweet, very calm and well behaved. Her DOB is Jan 1st 2011. Â Her sire is Trent Lee and her dam is Topaz Dani Rose. Pearl is just a little shy at first and tends to be timid in new situations. She will need a little time to warm up to her new family. She is doing well in foster care. Biter needs a new name. He is NOT a biter and never has been. Guess his owner was nearing the bottom of the name barrel. Biter is very sweet and social. He is very playful and was already playing with toys within minutes of arriving at his foster home. He wasn't phased by the trip up from the track or being in a home for the first time. He loves people! His sire is Domingo Dodge and his dam is Barts Joplin. Biter raced at Orange Park in Jacksonville Florida. He had an injury in his 3rd race in Jun of 2012 and was rested and rehabbed at the track until his next race on Dec 15th. He has raced since then but hasn't ever been able to win a race so was finally retired after 19 races. 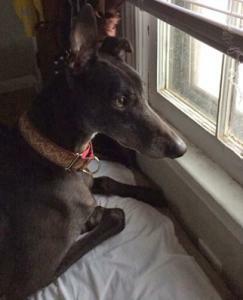 Biter was brought in specifically for his foster family and will be staying permanently with them if their current greyhound likes him. 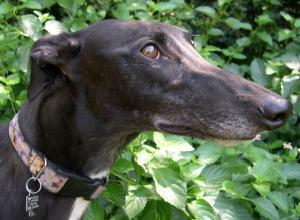 Miracle is a tiny greyhound puppy that is the result of an accidental breeding. Since her owner wasn't sure who her daddy was she can't be registered to race and was moved from the farm to our adoption group as soon as she was weaned. She was the only pup of the litter that survived so they called her Miracle at the farm. She is a confident girl that has gotten a lot of attention and is very social. She wasn't phased by being driven half way across the country or by anything in her new foster home. Well she isn't too fond of the leash and collar just yet. Greyhound puppies are not like the calm adults we love. They are full of energy and can run and play all day. Potential puppy owners must have large fenced yards for them to play in and experience with puppies. A puppy that can run 40 mph and reaches nearly adult size in 6 to 8 months can do a lot of damage unless it is supervised every second and has rules that are enforced. We placed two of Ralph's littermates Oscar and Otto. They are both sweet, calm, handsome boys that made great pets so we are very excited to get Ralph too. His sire is KJ's Yukon Gold and his dam is Gilded Rose. Ralph just turned 3 on October 7th. His trainers say he is calm and well behaved at the track. He raced 60 races starting out at Bluffs Run in IA and then moving on to Sarasota and Sanford Orlando in Florida. He crates quietly and is being fostered in a townhouse. He did well with the cats and small dogs that he saw at the vets office. Didn't seem to have any interest in chasing them so should be able to live in a home with them. Ralph will need a home with a fenced yard. He would pee on leash but wouldn't do any other business on leash. He held it for a couple of days at his first foster home so we moved him to a home with a fenced yard where he could be more comfortable. He just is way to polite to potty while on a walk on leash, we run into this a lot. 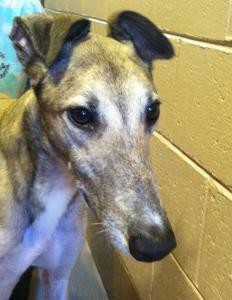 Kelly Bee just arrived from the Sanford Orlando race track where she raced at 51lbs. 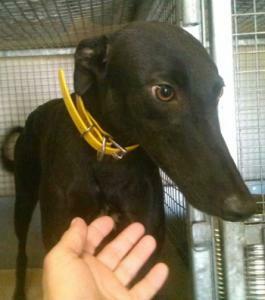 She is a tiny, friendly, little girl and was the kennel pet at the racing kennel. 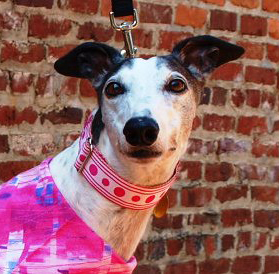 She raced for over a year but only because she was a pet and her trainers didn't want to give her up. She only won one race in her career and rarely even placed. She hasn't even raced at all since May. Because she had a dog at home already that didn't get along well with others, Kelly Bee's trainer wasn't able to take her home as a pet and eventually let us have her. 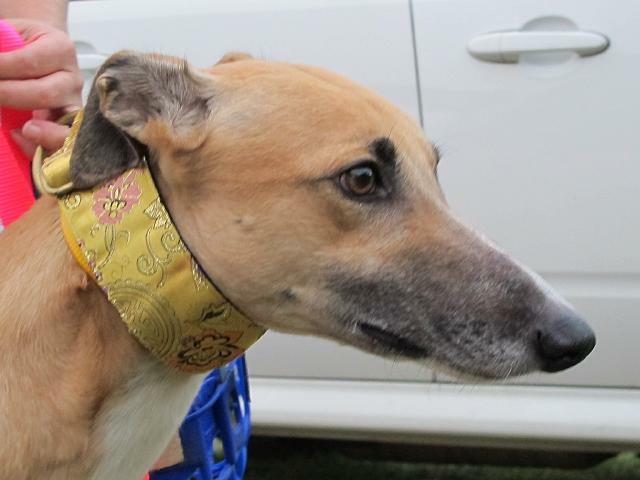 Everyone that has met Kelly Bee in the kennel and since she has retired just has fallen in love with her quiet gentle sweetness. We first met Kelly Bee on a visit to the track a couple of days after she arrived from the farm. We all fell in love with her than and she has had a line of people hoping to adopt her since then. She passed her cat and small dog tests and has loved the children she has met. Kelly Bee just celebrated her 3rd birthday on August 10th. Her sire is Tonys Oracle and her dam is WMS Sprint Away. Girl Friend is a cute red girl with a little black on her nose and cute floppy ears that flop toward the front. Pay no attention to her racing name- Crazy Girl - there is nothing crazy about her. She is actually very friendly and sweet. Her sire is the very famous Kiowa Sweet Trey and her dam is Fast and Furious. She raced at 64lbs and celebrated her 2nd birthday on May 28th. Girl Friend has 28 races to her credit - 1 win and quite a few placements. She raced at Sarasota and retired from Sanford Orlando. She travels well. She was good with the cats, small dog, ferret and two children in her first foster home, and equally peaceful with the dominant dogs in her second foster home. She is very affectionate and loves attention, always choosing to be with her humans no matter what is going on around her. She will crate and rest quietly at night or when left alone, but she would prefer to be out and about with her pack. Girl is smart and learns quickly so it is important that her family supervises her and teaches her what they want her to do rather than just letting her make up her own rules. 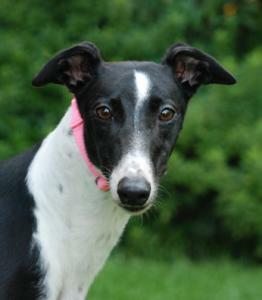 She loves to play and would love a home with a fenced yard that she can run and play in. Puddles is a handsome black male that just turned 4 on August 14th. He is very tiny for a boy and raced at just 63lbs. His trainers say he is a calm, well behaved boy. He passed his cat test at the track so should be fine to live with cats and small dogs. He had a pretty long racing career with 142 races. He raced his whole career in Florida, starting out at Sarasota, then heading to Ebro, back to Sarasota and finally to Sanford Orlando. There are different levels of tracks so greyhounds are often moved to a mid level track if they aren't competitive at a high level track. They might also be moved from a lower level track to a mid or high level track if they are winning a lot of races, in hopes they will be competitive against higher level dogs and will earn bigger purses. Puddles sire is the very famous Kiowa Sweet Trey, his dam is Ale Black Smoke. Puddles is quiet in his kennel and does potty well on leash so may be a good apartment or townhouse dog. He is very friendly and sweet. He makes great eye contact just staring up at you with the sweetest expression on his face hoping you will pet him. 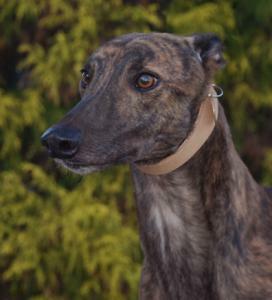 Dough is a pretty silver brindle female. Her trainers said she was a nice, calm, friendly girl that would probably do well in a home with kids. We will test her again with cats but they felt that she probably would be trainable with cats. Her sire is the famous Lonesome Cry and her dam is Kelsos Peach. She will turn 4 on Nov 13 and is 61lbs. She raced 98 races so had a pretty long career. She is quite the traveler. She started out racing at Bluffs Run in IA, then went to Naples/Ft. Myers in Florida, then to Sarasota, back to Dubuque IA, then back to Florida to the Sanford Orlando Race Track. Molly was originally adopted through another group that is no longer around. She has been returned to us because she suddenly started having problems with another female greyhound in her home after being fine for years. She is a sweet girl with people but may just need to be an only dog. 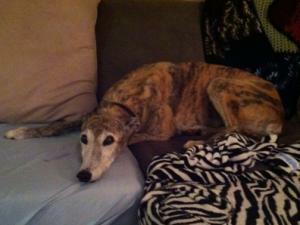 She has responded appropriately to all greyhounds she has met since she came into foster care though. It may have been a one time thing since the dogs had been living together for years peacefully before this. Molly turned 8 on Feb 18th. She raced at 60lbs and has 75 races listed. A few at Southland in Arkansas and the rest at Derby Lane in Florida. Her sire is the famous Oshkosh Slammer and his dam is Venus Theluvstar. Molly did not pass her cat test and mistakes very small dogs for bunnies so needs a home without them. She did fine at her first meet and greet with all the people she met and the other dogs around her. She seemed a little overwhelmed and wasn't going up to people much but wasn't shying away from people either. She is doing great in her foster home and seems to have good manners and is a calm well behaved girl. Sangria is a littermate to one of our own dog's Happy Stutz. We have waited for her to retire and she already has a home to go to. She is a tall girl that raced at 65lbs. Her sire is from England - Balligari and her dam is Elysium. She will turn 4 on December 1st. She has 99 races listed and started out at Southland in Arkansas and from there went to Palm Beach in Florida. She just retired from Sanford Orlando race track. She was never a great racer but was able to place at the lower levels and even win a few races. More as we get to know her. Bro is another one of the litter that retired straight out of training and didn't ever make it to the track. He is a black male that just turned 2 on May 26th. He is another tiny boy weighing only about 65lbs. His sire is Dave the Dog and his dam is Topaz Lass. Bro's foster home actually owns his dad Dave. Bro is pretty shy and needs some work on walking on leash because he freezes when he gets scared of new things. The shyness is genetic and we have gotted quite a few shy pups from Dave. They all end up being great loving pets once they get over their initial shyness though. Just takes a few months of patience on the part of their adoptive family. So far Bro has bonded very quickly to his foster mom and stays close to her following her around. He is pretty shy still of his foster dad though. Bro did great with a pug he met and wasn't even that interested in some chickens he rode up with, so seems like a pretty low prey drive guy that would be good in a home with small animals. He really likes having another greyhound to follow around and seems to learn from watching. When we took him to the vet a kid ran up to him and gave Bro a big hug before we could stop him. Most shy dogs tend to be more fearful around quick moving children but to our surprise Bro relaxed and did a little sigh and never made any move to avoid the child or get away. Even very social dogs don't normally enjoy being hugged by small strangers but Bro didn't seem to mind. Bro is on medical hold for heartworm treatment. He is expected to be cleared for adoption after it is completed around October 10th. Monster is a very sweet ,calm boy that is well behaved at the kennel. His trainer says he is a very beautiful fawn but instead of being tan with black ears, black nose and tail that fawns usually have he is the tan fawn color with blue grey ears nose and tail. He is a larger guy that raced at 77lbs. His sire is Iruska All Star and his dam is RK's Proformance. He celebrated his 4th birthday on the 4th of July. He had a long career of 143 races. He started off in Wheeling WV, then went to Southland in Arkansas. From there he went to Palm Beach in Florida then to Melbourne and finally to Sanford Orlando where he retired from. He seems like he will cat and small dog friendly because he didn't appear to be very interested in chasing either at the vets. Larry is a red male from the litter that retired out of race training and didn't make it to the race track. Larry is one of the more confident friendly boys in the litter. His sire is Dave the Dog and his dam is Topaz Lass. Larry's foster mom owns Lass's brother and another of our foster homes owns his dad. Larry turned 2 on May 26th so he is a young guy. So far Larry seems like the most outgoing of the brothers. He does like people and will approach for petting so isn't really shy like some of his brothers but can be a little nervous when first meeting strangers. He will warm up quickly though and definitely prefers his foster dad to his foster mom so would be a great man's dog. 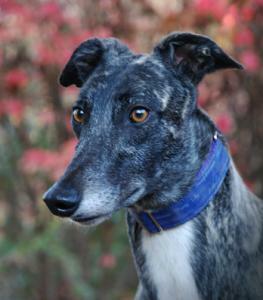 He has played well with the other greyhounds in his foster home. He isn't pushy or bossy in play so would probably be fine to live with a more dominant dog. He passed his small dog test with no interest at all in a pug and seems like a really low prey drive guy because he didn't even pay any attention to some chickens that he rode up with. He is just a bit timid but only with some new things but seems like the type that will warm up fast and be a playful silly guy with a lot of personality. He playbows to his foster parents trying to get them to play with him. He enjoys running and playing outside. He does need some work with walking on leash because he will freeze sometimes if something scares him. With exposure to lots of new things by a confident owner, Larry is going to gain confidence quickly. 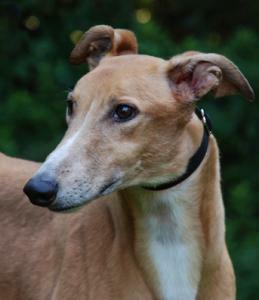 Larry is on medical hold for heartworm treatment and is expected to be cleared for adoption around Oct 10th. 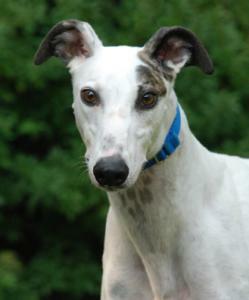 Henry is a white male with brindle spots. 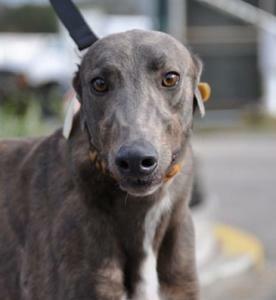 He is very friendly and would play with his trainers at the track if he spots someone that he even thinks might be interested in petting him his tail starts wagging and he tries to make his way over to see them. He also passed his cat test with no interest and hasshown no interest in chasing cats or small dogs he has seen on walks in the neighborhood so he seems like he would do really good in a home that has small furries. He raced at Â 73lbs so is a mid sized guy. He will celebrate his 3rd birthday on Oct 20 and he hopes to celebrate it with his new family. His sire is the very famous Kiowa Sweet Trey and his dam is VV Here We Go. He raced 69 races and started out at Bluffs Run at Council Bluffs IA, from there he went to Sarasota FL and then on to Sanford Orlando Track where he retired. So far he has done great at his foster home. He has had no accidents in the house and going potty on leash very nicely since his foster home doesn't have a fenced yard. He seems to pick up on things quickly and has already picked up on walking nicely on leash after pulling pretty hard to begin with. He is a very loving guy that his foster home is really enjoying. He may do OK as an apartment or townhouse dog since he does potty on leash and so far has been quiet when left at the townhouse he is fostered in. Serena is a mostly white female with black spots. Her trainers at the track say she is a really nice dog that follows them around. She is young and just turned 2 on July 29th. She only raced 15 races all at the Sanford Orlando Race Track in Florida. She raced at 61lbs. Her sire is Kelsos Fusileer and her dam is DS Katie. So far Serena is doing great in foster care and is very calm and well behaved. She walks nicely on leash. Messy is a red fawn, puppy girl that came to us directly from the farm. She weighs about 55lbs. Her sire is the very famous Kiowa Sweet Trey and her dam is CTW Folklore. She celebrated her first birthday on 4-1-13. Messy is not going to be trained to race because she had a broken upper back leg that effects her stride a bit. We had it X-rayed and it is totally healed and she loves to run and play and the injury doesn't seem to cause her any pain and doesn't slow her down much. 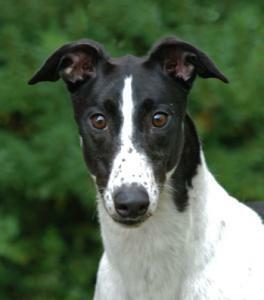 Messy is very calm and well behaved for a greyhound puppy. She is sweet, friendly and loving. Her foster home recently took her on a beach vacation with them and she was very good at the hotel and enjoyed traveling and interacting with all the strangers she met. Nothing seems to phase her or get her stressed out. She takes everything in stride. She loves hugs and kisses and is crate trained. She has some puppy energy but is not bad and she has become one of their favorite fosters. She loves to snuggle on the couch with her foster family and the other dogs. Getting a greyhound this young is a rare opportunity. Messy did pass her cat and small dog test and has been good with the children she has met so she should be a great family dog. Kerry is a mostly white girl with a few brindle spots. She is a tiny girl that raced at just 55lbs. She had a pretty long race career, racing 104 races all in Florida. She started out at Derby Lane and from there went to Palm Beach and then to Sanford Orlando Race Track. Her birthday is 3/7/10. She is very unique because she had the tip of her nose bit off by another dog when she was a puppy. Most of the black part of her nose is gone which gives her a little bit of a piggy look but she is still beautiful. Because she was different, she got lots of attention at the race track. Everyone stopped to see her and pet her and she expects that and loves to have people pay her attention. She is very friendly and loving. Her sire is the famous Kiowa Mon Manny and her dam is Tailteann Slippy. Kerry potties well on leash and travels well. She has whined a bit in her crate so may not be a good apartment dog. She did pass her cat and small dog test so should be fine to live with either. Mud is just retiring after a successful racing career. He raced a lot longer than most until he was 5 years old. He just celebrated his 5th birthday on August 23rd. He is quite the traveler racing at Bluffs Run and Dubuque in IA, and Southland and Sarasota in Florida. He just came to us from the Orlando Race track. Mud's sire is the very famous Flying Penske and his dam is Charity Day. He passed his cat test at the track with no interest in cats at first then only a little interest even when the cat ran. On walks outside when he sees cats in the neighborhood he doesn't even pay attention to them so seems to be a very low prey drive guy that should be OK to live with cats and small dogs. He is a mid sized guy that raced at 70lbs. He is a very calm guy that traveled well on the trip over from the track. His trainer says he is a friendly, well behaved guy that never caused any trouble. He is doing great as a foster in an apartment. He potties well on leash and is very quiet in his kennel so should be a good apartment or townhome dog and would be a good dog for a home without a fence yard. He is a dream to walk on leash and never pulls. He does stairs like a champ and has liked kids he has met. He did well at his first outing at PetSmart and was calmly friendly to people he met. He hasn't had a single accident in his foster home and hasn't even tried to mark. This is good boy that should be an easy addition to just about any household. 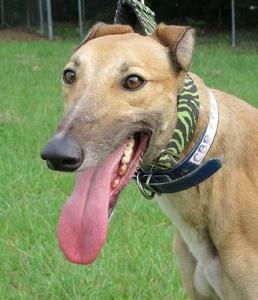 Ernie is a larger male that raced at 79lbs at Orange Park in Jacksonville FL. He only has 22 races listed and has been retired for several years now and in a home. We were asked to take him because his former owner had to move into an apartment that wouldn't take dogs due to a divorce. 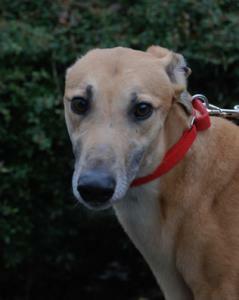 Ernie has good house manners and is good with cats, small dogs and children. He is a very sweet, friendly boy that likes to play with other dogs. He is very calm and well behaved. His sire is Super Lee and his dam is Pak Seminole Win. Ernie turned 6 on March 31st. He traveled well on the trip into foster care and seems like a wonderful guy. Be sure to check out his other photos- these were collected by Ernie's trainer at the track so are from when he was still racing. The one on this page is the only one we have of him that is recent. 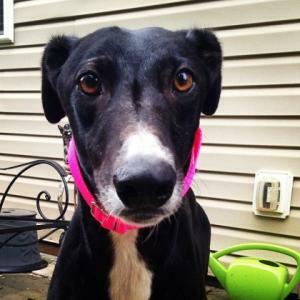 Angie is a beautiful black girl with white chest that we call a tuxedo. She turned 6 on July 14th. She doesn't have any races listed but her racing weight is listed as 61lbs. Her sire is the very famous Flying Penske and her dam is Kiowa Delicate. Angie likes everyone and is very sweet and calm. A very laid back girl that has lived with cats and small dogs. Angie has been living in a home with children and does well with them too. She should do well in just about any situation, just a great girl. She was returned to us with Robbie from the home they have been living in since they retired through no fault of the dog's. Angela has had a few seizures and is on a daily medication for them but they are well controlled at this point, she also takes daily inexpensive thyroid meds. Angie's favorite thing is a soft, comfy dog bed where she can sleep the day away and love from her family when she wakes up. We have Angie and Robbie in separate foster homes and they are doing fine apart so we will adopt them out separately. Robbie is being returned to us with Angela from an adoptive home that has had them for 4 years. Not the dog's fault at all but the owners can't keep them. Robbie turned 8 years old on April 29th and is small for a guy and raced at just 67lbs. His sire is PA's Mumbles and his dam is PA's Ronzilla. He raced just 21 races at Lincoln Park before he retired. Robbie's owners said that he is cat friendly and is also good with small dogs. He is just a little shy at first with new people but quickly warms up. After just a couple of days with his foster mom he was seeking out petting and would calmly lean against her for affection. While he likes affection he does spend a good part of the day napping so isn't needy or demanding. He has lived in a home with kids and did well with them. He loves to go for walks and will walk over, look at his leash and whine to remind you it is time for a walk. He responds quickly to "No" though and goes and lays down if no walk is scheduled. He is doing great in his foster home and has had no potty accidents. He has great house manners and has settled in like he was always there. He has crated well and is in this foster home by himself so seems like he would be fine as an only dog. 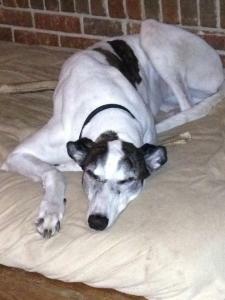 His foster home says he is very calm and easy going and already is a nearly perfect pre-trained pet. This is a sweet guy! Tazzy is a very young, red female that won't turn 2 until October 9th. Her sire is Flupascrackerbox and her dam is Bills Are Due. She just arrived from the Orange Park Race Track in Jacksonville Fl. She only has 6 maiden races listed and didn't placed in any of them. She is a small girl that raced at 57lbs. She passed her cat test with only a little interest at first but she quickly lost interest in the cats once she sniffed them and realized what they were. Her track trainer said she was a little shy when she first arrived there but that she warmed up fast and within a couple of weeks she was friendly and happy. She is a curious girl and seems to like people and always comes when called. She can be just a bit cautious with new people but did well at her first meet and greet and did approach strangers for love. She travels well and laid down calmly most of the trip. Tazzy complains about being in her crate sometimes so probably is going to to be a little too loud to be an apartment dog. We have discovered that she is pretty quiet as long as another dog is kenneled next to her and is normally only loud when she is kenneled by herself. She has learned to kennel quietly all night by herself though. She does potty on leash very quickly so should do fine in a home without a fenced yard. This is a sweet loving girl that may be just a little shy at first but will warm up fast! 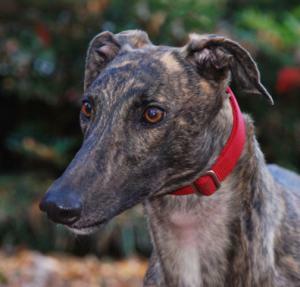 Emo is a beautiful light fawn with some gray brindle stripes and golden eyes. She is a larger female racing at 69lbs. She is 2.5 and won't celebrate her 3rd birthday until Nov 25th. Her sire is DK's Prime Time and her dam is a sweet girl we have actually met named T Dazzle. Emo was raised on a farm with a lake so she enjoys swimming and playing in water. She is very friendly and happy. She did pass her cat test at the track and seems like she will be good with small dogs as well. 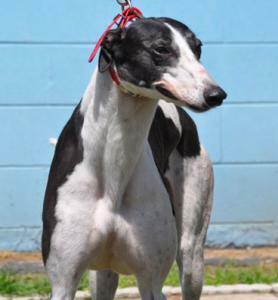 She only has 15 races to her credit at Derby Lane and won 2 of those. Although we just got her she has actually been retired since November of 2012. Check her other photos for pictures of what she has been doing while waiting on the farm. Patch or Peaches as we have been calling her is a mostly white girl with some red spots on her face and ears. She has 59 races to her credit, briefly racing at Palm Beach but spending most of her time at Sanford Orlando. 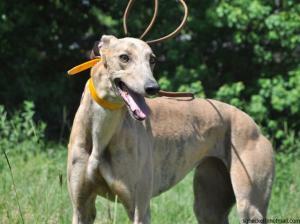 Peaches raced at 63lbs and her sire is Djays Octane and her dam is Whytell Bali. She passed her cat test at the track but has been a little too interested in chasing cats for us to think she will be OK to live with them since she arrived. She also has mistaken small dogs she has seen on walks for bunnies and seems too interested in them to us to be considered safe. She is doing great with several kids in her foster home so would be excellent for a home with children. Peaches is very friendly and loving and loves to be with her people so much that she just goes outside briefly to do her business and comes right back in to be with her people. She complains sometimes when in her crate so probably wouldn't be a good apartment dog. 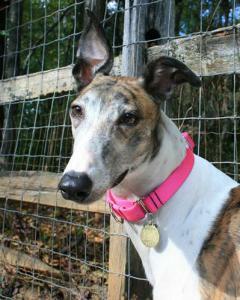 Peaches is a gorgeous, sweet, happy girl! She is young so is fun and playful and higher energy than most of the older dogs. What a cute girl!! Dream just arrived from Orange Park race track in Jacksonville FL. According to her race record she only raced there once and was moved there after racing at Derby Lane and Daytona Beach in FL. She only raced 31 races and won 3 of those and placed some. Her sire is Tyrur Alex and her dam is Peltys Dream. She turned 2 on Feb 12th and raced at 60lbs. 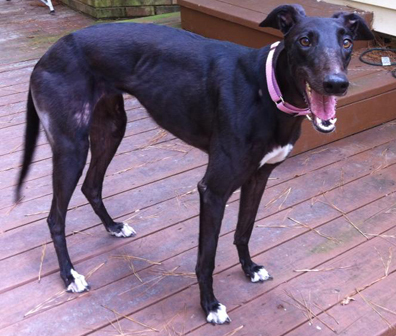 She is described as a sweet, friendly, happy girl that gives kisses and loves everyone she meets. She passed her cat and small dog tests with no interest at all even in a kitten. She is living with a small child at her foster homes and seems to like kids. This is a sweet girl that seems like she would be good in just about any situation. Dream was originally placed by another adoption group and was returned to us after being in a home for some time so she is already home acclimated. Dream lived with children in her previous home and was very good with them. She also lived with cats and small dogs so would be excellent in a home with them too. She is in a foster home with a couple young dogs of other breeds and loves to play with them and seems to get along well with other dogs of all types. She is a very friendly girl and loves kids. At meet and greets she is absolutely the star of the show greeting each person. She is very much the snuggler. If you sit on the floor she will lay in your lap. If you are looking for a true companion that will adore you Dream is the girl. Dream loves to play with toys too so is a fun girl. She can be vocal sometimes so would probably not be a good apartment dog. She is a smaller girl that raced at 59lbs. Her sire is Impossible Dream and her birthday is April 13th. 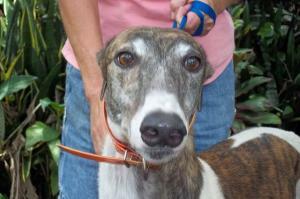 Dream does have some separation anxiety but seems to do well if she is in home with other dogs. A home with other dogs is something that is required for her. 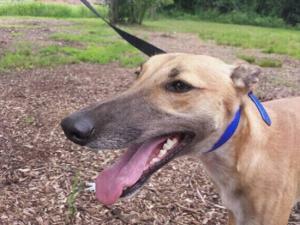 Hyatt is a small red male that raced at 69lbs. He just turned 4 on May 1st. He is quite the traveler racing at Gulf, Sarasota, Ebro and Dubuque. He has 91 races listed. His sire is Gable Oscar and his dam is Lil Cash Advance. He has done well with the toddler in his foster home and the small dog next door. He needs some work on his leash skills but is getting better already. He has been a little loud in his crate so may not be a good dog for an apartment. He is doing well settling in to his foster home and turned into a favorite foster very fast. Hyatt is a friendly guy that likes adults and children. He is SO cute with all that eyeliner and those eyebrows! Hyatt would be a wonderful dog for someone that would like to compete in obedience or agility. He does a natural flip finish when you say his name! He wants to please and seems like he is willing to work and do just about anything for attention. 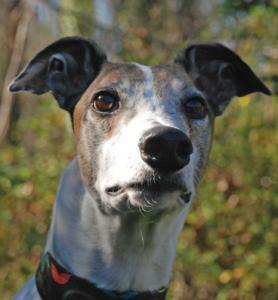 He has a higher energy level for a greyhound and that is important for a dog that you want to do training with. He is a fun guy that would also be a good hiking or jogging partner. He is very loving and wants to be a big lap dog. He is all about getting attention and love.